Okieladybug's Scrap N' More: I'm Set To Foil! Sometime ago my friend Rosemary acquired the Minc and since she already had a laser printer and very nice laminator she was kind enough to send me her laser printer and laminator saying she didn't need them anymore because of the Minc. I have done very little foiling because I was afraid of the cost to replace the toner cartridge in the laser printer but there have been a lot of things I have been wanting to make and incorporate the foiling process. If you follow me on Facebook you know I am a bargain hunter, don't even get me started on some of the Goodwill finds I have gotten! I am willing to dig for good bargains and believe me when I say this is not a euphemism. A few months ago a store called Zipp Outlet opened up not far from my house. I don't even know how to explain this store other than think of a tornado hitting an Amazon warehouse. The picture is actually not long after they opened and I have never seen it that neat in my many stops into the store. Most of the items are evidently returns from Amazon and there is no rhyme or reason to the way they stock the store, other than most grocery items are on one wall together and big items are on large shelving apparatus type things in the center of the store. Other than that, well things are thrown on shelves, not neatly I might add, or just in big boxes where you simply have to dig through to look at things. I have been in there a few times and I have found some good bargains. The store definitely challenges my OCD tendencies and I have been known to try and straighten up some of the items on the shelves. 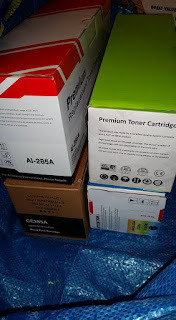 They have had quite of few of laser printer toner cartridges for around $4.00 and I kept meaning to check my laser printer that is used for foiling with a laminator to see if I could find some cartridges for my printer. I finally remembered to write down my printer, which is an HP P1102w, so I could see if they by chance had any that would work with my printer. Another thing you probably dont know about me is that I am willing to sit in the floor of stores and dig at stuff to see what I could find, which is exactly what I did today. 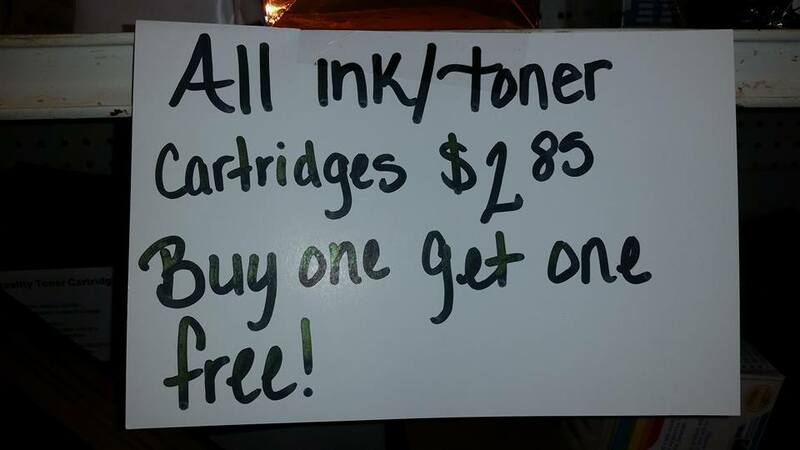 When I got there and looked around I saw the sign that they had put the cartridges on sale. OH EM GEE!! I couldn't believe they were this cheap so that made me more determined to find one to fit my printer. I spent quite a bit of time sitting on the floor going through what they had, sorting and stacking neatly as I went along, keeping my eyes peeled for the magical letter and number combination. I wasn't having much luck until BINGO! 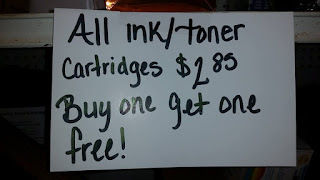 I was thrilled to find a cartridge that fit my laser printer and that made me even more determined to find another so I could get one free. As luck would have it, or determination we are going to say in this case, I was able to find 3 more with my tenacious digging! They look to be all different manufacturers and that is okay. Heck it's even okay if they don't print a whole lot because at less than $1.50 each I will be thrilled if I can even do a little printing off them. Now I will just need to find another great deal on the foil, different colors of course, and I will be all set to foil until my hearts content! I love reading about your "bargain hunting forays." I am also a bargain hunter, but not nearly as accomplished as you! I'm in awe. Whoa ... are you kidding me? 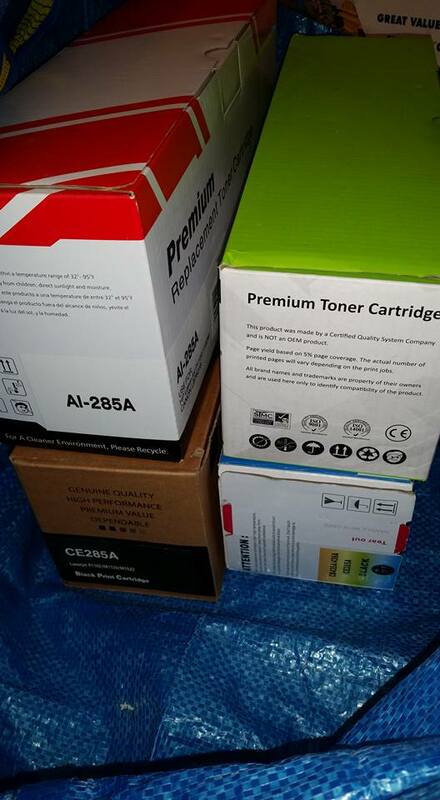 Four toner cartridges for less than $6.00? That is insanely low and definitely worth the time and efforts to sit on the floor and dig through that mess. I cannot wait to see your foiling projects. You are going to have such fun with it. But be forewarned ... foiling is very addictive. I've been foiling for some time now and I love it. If you have any questions along the way ... just holler! You are the "Queen of Bargains"! Congrats! Gotta love a great bargain!!!! Great finds. You find the best deals. We don't have that store around here. You and my Sister would get along really well. She is a bargain hunter also. I can't stand that long and root. She will go through every clearance rack and find some really good deals. I will look until my back gives out or my heart goes out of whack then I have to leave.